Properties in Central Okanagan average 4.6 out of 5 stars. Beautifully appointed 2BR Cottage at LaCasa! Property 56: Beautifully appointed 2BR Cottage at LaCasa! Best Location In Town! One Block From Okanagan Lake And Downtown Kelowna! Property 58: Best Location In Town! One Block From Okanagan Lake And Downtown Kelowna! Walk to all the best Kelowna has to offer! 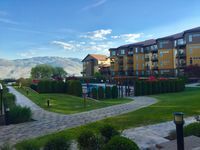 Property 63: Walk to all the best Kelowna has to offer! Bella Cottage @ La Casa Resort, 180 Degree Lake View!! Summer 2019!! Property 65: Bella Cottage @ La Casa Resort, 180 Degree Lake View!! Summer 2019!! Delightful Suite With A Lake View. Property 74: Delightful Suite With A Lake View. Stunning 2 bedroom plus LOFT Lake+Pool view/top floor condo w/wifi/Sleeps 10. Property 76: Stunning 2 bedroom plus LOFT Lake+Pool view/top floor condo w/wifi/Sleeps 10. Suite with Magnificent Views Close to many Outdoor Activities. Property 79: Suite with Magnificent Views Close to many Outdoor Activities. Suite Serenity at Black Mountain in the community of BlueSky! Property 84: Suite Serenity at Black Mountain in the community of BlueSky! Idyllic getaway with pool, offering panoramic views yet close to everything! Property 87: Idyllic getaway with pool, offering panoramic views yet close to everything! Private, heart stopping lake/mountain view, hot tub, perfect couples get away. Property 96: Private, heart stopping lake/mountain view, hot tub, perfect couples get away. We had a good time staying at this spot. The location was good for us as we were visiting for a wedding. The owner's were very responsive and helpful when we had questions, which was great! Only disruptions while we were staying in the area was a road closer and water advisory but that didn't impact the quality of our stay. I would recommend this VRBO. Great property! Clean and charming!! !